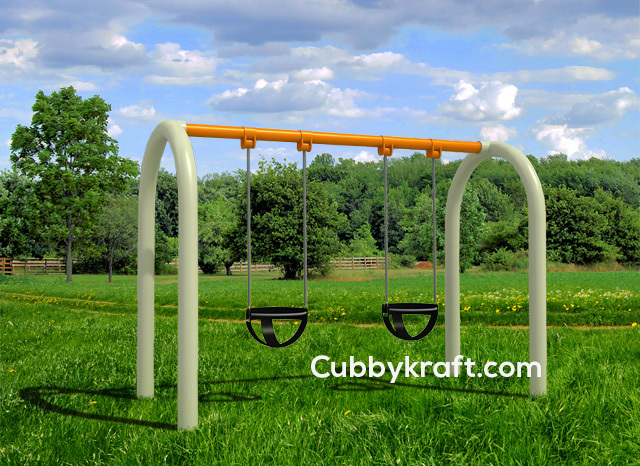 The CubbyKraft Infant Swing Set is the perfect outdoor play toy for a backyard of a family with infants and toddlers. The seats are made to wrap around the infant's bottom and protect them as they swing back and forth with an adult supervising. Most infants love the feeling of the swing because of the motion that it creates. By using the CubbyKraft Infant Swing Set you are giving your baby a great chance to get outside and enjoy the fresh air while being in a protected swing seat. As your babies get older, you can switch out the type of swing with others, like an animal swing. At CubbyKraft we offer all kinds of outdoor toys to add to your possibilities so you can design the perfect playground for your kids. The CubbyKraft Infant Swing set is made of durable metal with rubber swings and will stand up to any outdoor weather conditions. 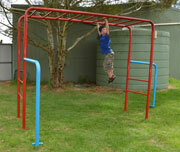 It will fit in most backyards and is an excellent addition to a home daycare outdoor play area. There are two swings to accommodate more than one baby or toddlers who also fit in these types of swings. Great swing set for a growing family with young children. Our Infant Swing is easy to install as it comes with a manual that contains a systematic process of putting up the Infant Swing set. Do-it-yourself consultants are always available to give you a hand through email and over the phone during normal business hours (see the contact link above).